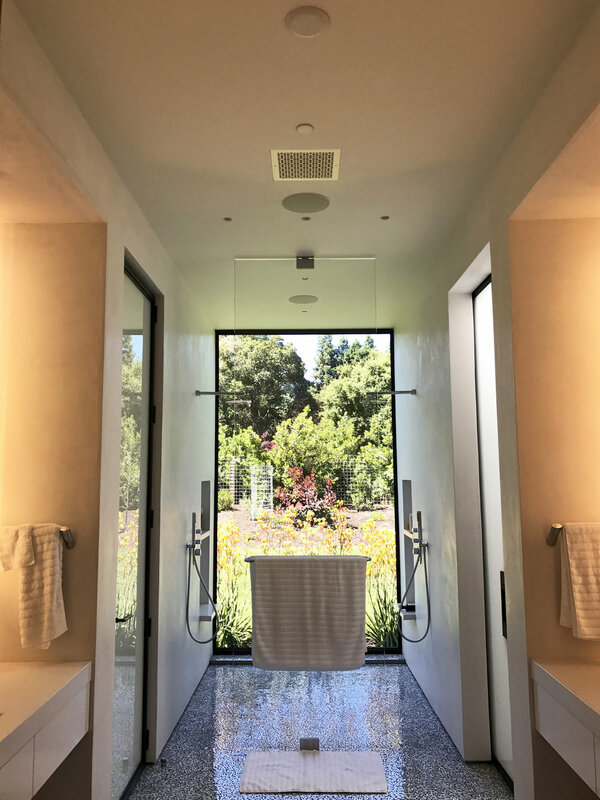 The master bathroom is a symmetrical, rectangular space bookended with large windows. There is also a glass divider separating the showers from the rest of the room that is parallel to the windows. The sculpture for this space was originally going to be a light, but ended up being a non-illuminated sculpture that relates to, and is activated by, the man-made and natural light in the space. In a room with many angular and planar architectural elements, part of my challenge was to create a sculpture that spoke to these aspects of the space while maintaining the calm, clean, and minimal feel. Adding additional planar elements came with the risk of cluttering an already narrow room. Determining the relationship I wanted to establish between my sculpture and the space emerged progressively throughout the design process. Another challenge was working with the infinite echoing of mirror images created by the two large mirrors facing each other over the sinks. The most spectacular feature of the master bathroom was the translucent white, marquise-shaped glass tiles over charcoal colored grout on the floor that designer Fannie Allen selected. Variation in their level of translucency made each tile’s appearance vary from white to grey, which creates a dynamic feeling. There is a glamorous, almost disco-ball effect of the sunlight and other lighting in the space catching on these shiny elements on the floor. Although these forms did not make it to the final version of the piece, their reflectivity remains as a thematic connector. While exploring the details of this room I kept coming back to the sky reflected in the divider glass next to the showers. The composite image of clouds, elegant Japanese maple branches, and poplar outlines was an inspiration for me. It led to the idea of making a sculpture with reflective planar elements that would speak to these natural components. Through experimentation in the hot shop I created blown glass vessels that replicated colors and cloud formations found during different seasons at different times of day. 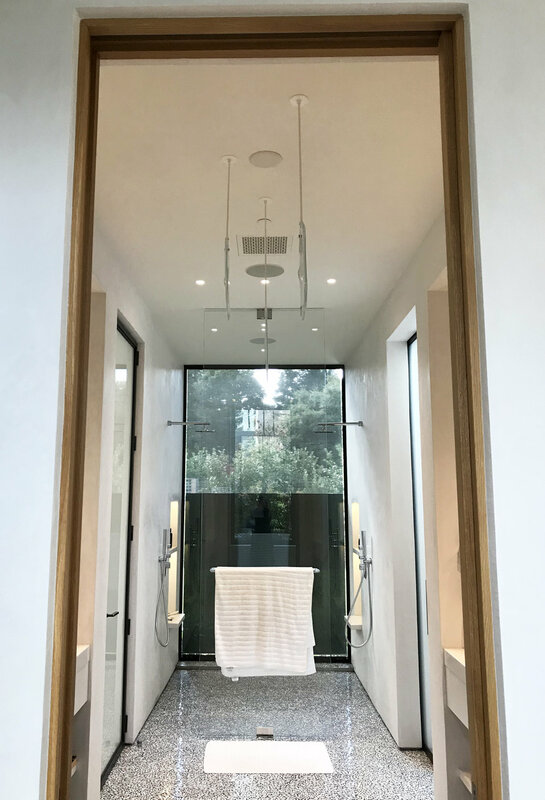 Although both my clients and I were connected to the idea of using the sky glass I developed, we needed to land on a form that would suit the space. The first iteration of this sculpture was a four-sided open box form, reminiscent of a room or a box kite. The exposed edges of the organic glass plates contrasted with the angular exposed edges of the divider glass by the shower. 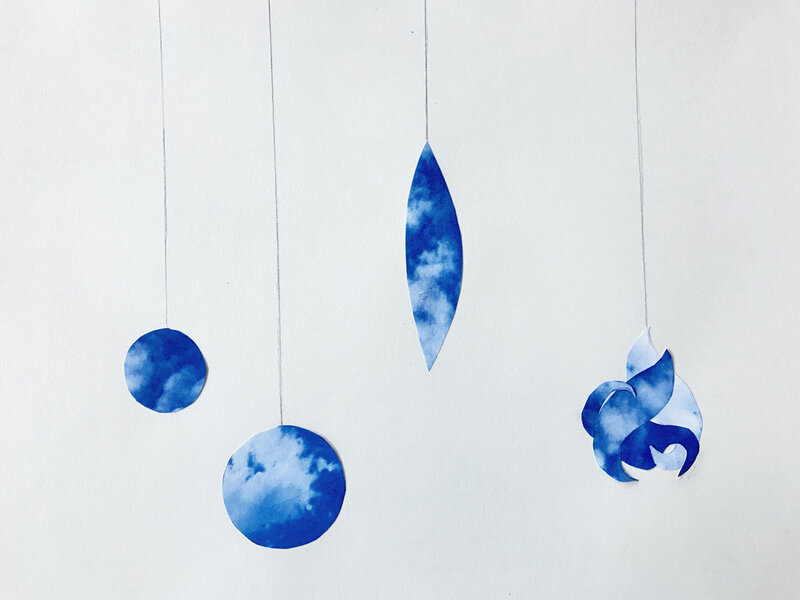 We liked the free, airy, and fun associations tied to the box-kite form, but wanted to keep with the theme of weightlessness. With this objective in mind, we ruled out this version because the armature would be too visually heavy. From then on we progressively deconstructed the piece from a four-sided form, to a three-sided form, to no form at all. Peering into facing mirrors can be a mesmerizing experience. The infinite repetition of all the elements in the room captured in the mirrors forms what looks like an endless curving funhouse hallway. I wanted my sculpture to integrate into these repeated images in an interesting and visually grounding way. My addition needed to be graphically strong so it would enhance the rhythm created by the repeated reflections.